How Likely is a New Ban on Gold Ownership in America? 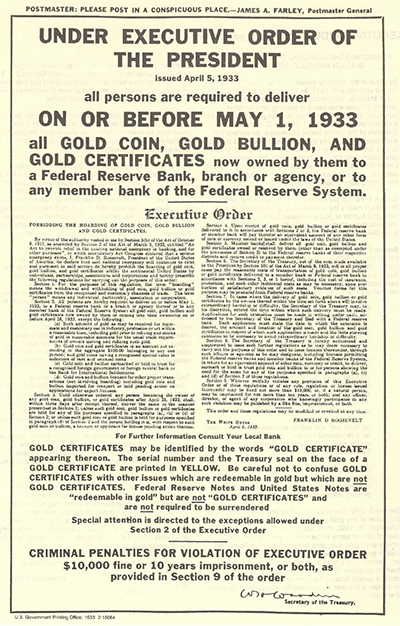 President Franklin Delano Roosevelt issued Executive Order 6102 in 1933 (reprinted below). And since gold ownership was legalized again in the early 1970s, the specter of this 80-year-old attack on wealthy "gold hoarders" still haunts investors. As the federal government grows more authoritarian and insolvent, investors should indeed worry about what kind of desperate measures may be coming. But as described here, a new ban on gold ownership in America seems less likely than other actions. Section 1. For the purpose of this regulation, the term 'hoarding" means the withdrawal and withholding of gold coin, gold bullion, and gold certificates from the recognized and customary channels of trade. The term "person" means any individual, partnership, association or corporation.